Children’s early childhood experiences, below six years old, is a critical time for forming certain behaviors and an excellent means of affecting their parents behaviors too. 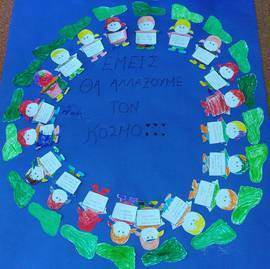 So we’re very happy to have had 6 kindergartens from the Municipalities of Kalamaria, Pilea Hortiatis , Thermaikos, Thermi and Thessaloniki participating in the ZOOM Kids on the move Campaign for the first time –welcome on board! A total of 196 children took part in the activity and gathered 823 'πράσινες πατούσες' or green footprints for every journey they made by foot within one week, leaving the car at home. Teachers and the children through a series of educational methods, such as painting and crafts, theater and storytelling learned about the impacts of car fumes on the environment and climate, alternative ways of transport, the journey of children from home to school in developing countries and how the lives of these children, and many animals there depend directly on the climate. Finally they discussed how they would like to turn their own cities for the better, and asked for more and safer pavements to go to school by foot and more space for extracurricular activities like meeting friends and for biking etc. 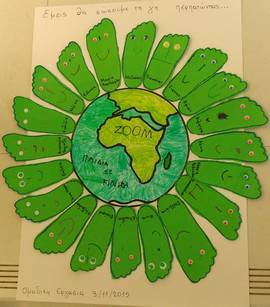 Some pupils created slogans, posters and even songs for climate protection! 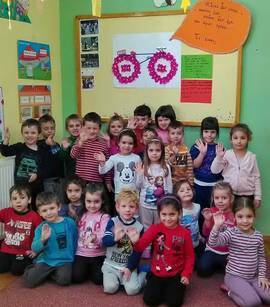 The Kindergarten Bilios Stegi participated in the Zoom activity from 2.-9. 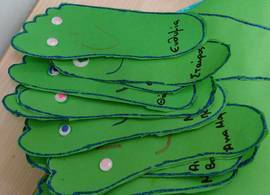 November with 3 classes, one of preschool children with 25 pupils and another two classes of smaller children with 50 pupils, together they gathered 124 Green Footprints. 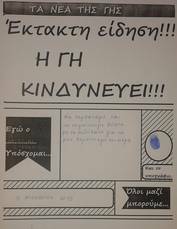 The children discussed with their teachers about public transport in Greece and other countries and learned how to move with environmentally friendly means of transport for their everyday activities. Finally the children designed their footprints and stuck them on a clean planet, indicating that walking contributes to a clean environment. 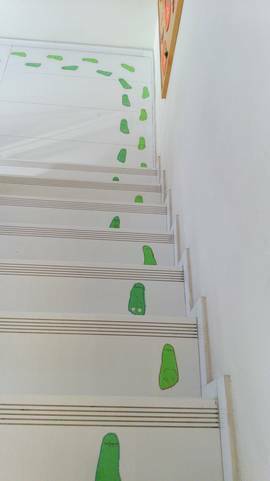 The rest of the children’s footprints were glued all over the kindergarten’s hallways to remind all children, parents and staff to rather walk than take the car. 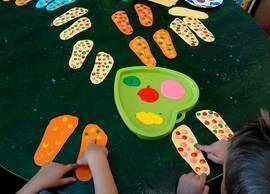 In the Municipal Kindergarten of Pilea 28 children from the pre-school class took part in the ZOOM activity from 2-9 November and together collected 135 Green Footprints during one week. 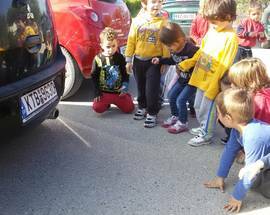 During their action week they did a serie of interactive activities learning about global warming and how the cars contribute to this. 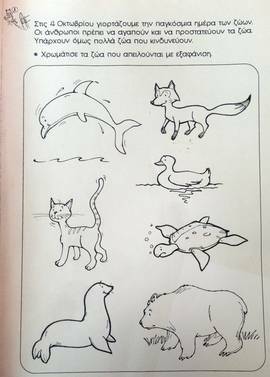 They also heard about animals at risk of extinction due to climate change. Finally they got acquainted to the daily life of children in other countries through pictures and what they do there for protecting our climate. They also learned about environmentally friendly means of transport and how children in other countries go to school. Through a puppetry they heard about global warming and through pictures and paintings they got to know about animals in danger of extinction due to climate change. 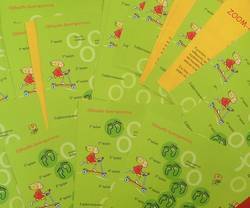 At the Dimarakios Kindergarten of Michaniona the preschool class (4-5 years old) with 25 children gathered 140 Green Footprints 29 October- 6 November by making journeys to and from school as well as extracurricular activities on foot. The motto of their action week was: Forget about your car - love the environment! 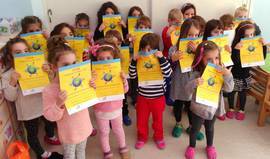 The children learned how car gases affect the atmosphere and hence the climate. They heard about climate change and its effect on animals and humans on other continents. They discussed how climate change has affected their own daily life with some of the most devastating floods in recent years. They produced a press release and took it home to their parents informing them that for a week they should leave the car at home. 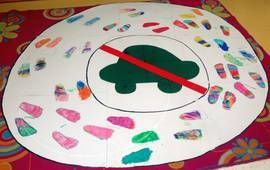 At the end of the week they cut and painted their footprint with drawings that indicate a clean environment. The press release says: Breaking news!!! Our earth is in danger!!! We better walk and ride our bicycles to not pollute the air. 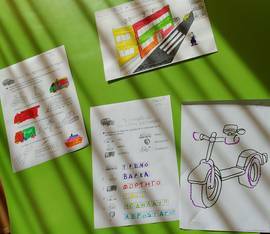 The children also discussed about negative impacts of car gases and about other friendlier means of transport such as busses, bicycles and their feet! 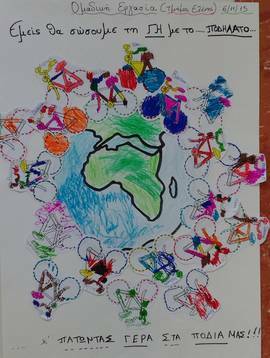 They learned about means of transport in other continents and how dependent the children and their families are on climatic conditions there. In the end they discussed how climate change is already affecting their own life. 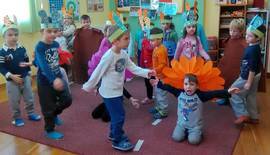 The municipal kindergarten of Thermi participated 2-9 November with 25 children aged 4-5 years. Together the children gathered 128 green footprints. Through photographs they learned about the everyday life of children from developing countries and how climate affects their living. They also learned about how car gases contribute to the deterioration of the air quality in their city and to climate change. And they talked about how they would like their own city to be changed and therefore asked for more spaces for biking, more public transports and more green areas. Finally they cut out and painted their footprints as well as an image of themselves and added a message from each of them about how they want their city to be changed for the better. 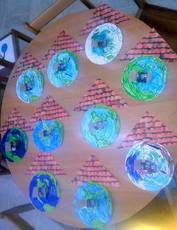 The School of Nature participated November 5-13 with 18 children aged 4 to 5 years. Within this week the children and their parents gathered 93 green footprints for every time they went somewhere by foot instead of using their car. 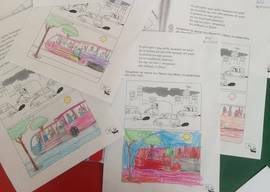 The children learned about the impact of car fumes on the environment and climate as well as about noise pollution and ways of transport children use in developing countries. 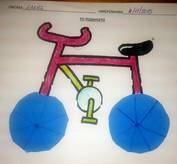 They also learned about clean means of transport and rode their bikes at the school yard. When coming to school with the school bus they said it was much more fun than coming individually by car because they could meet their friends in the bus. 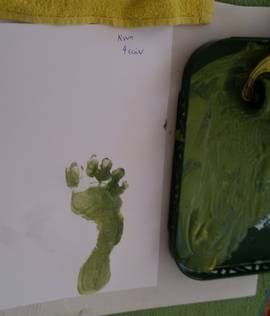 At the end of the week the children drew their own green footprint on a piece of paper which they took home to their parents to remind them to use their feet more often! 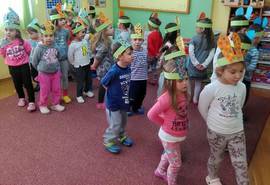 The kindergarden of Ipsilandou participated from November 2-9 with 25 children aged 4-5 years. They gathered 203 Green Footprints in total. 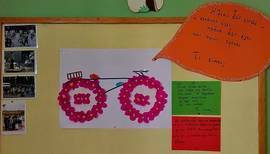 During their activity week there were discussions and handicrafts on climate friendly modes of transport and they talked about how kids in other countries go to school or how cars affect our planet. The children said they don’t like cars, because they produce fumes and make the sky gray. They would rather like to see a blue sky and the sun. They also thought that the bus is faster within their city and fits more people. They really enjoyed walking because they could meet with their friends before classes when walking with their parents. 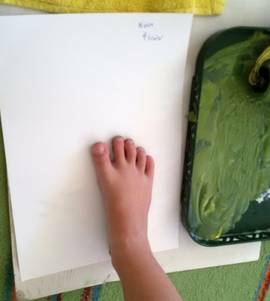 At the last day of the week the children showed what they have learned with music, dance and theater and painted their feet on cardboard and plaster. 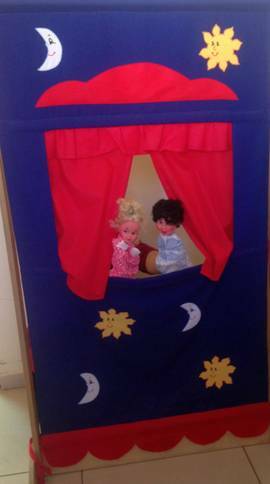 The children and their teachers wrote a song that was the basis of the theatre play they produced. They dressed as trees and flowers with sad faces because the cars around them are polluting the environment. But when people walk among them they look happy. The children’s song said: "I walk, I walk to go to school, I walk, I walk to go to the doctor, I walk, I walk with my two feet, I dance and I jump"
They also built and raised a protest poster on global warming saying: A planet without fever, because my feet are the medicine.